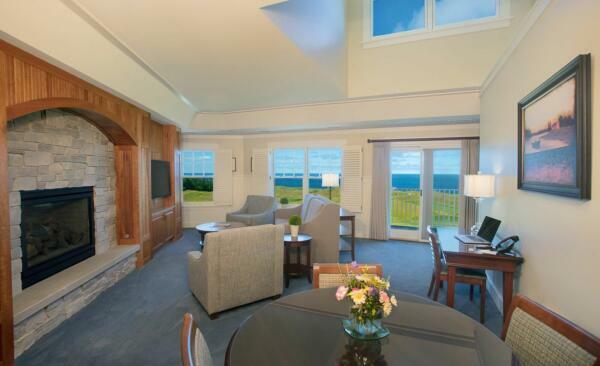 The Lodge at Arcadia Bluffs is located on the second level of the beautiful Nantucket coastal estate-style clubhouse, and accommodates 15 comfortably appointed guest rooms and 1 suite with a seating area and kitchenette. 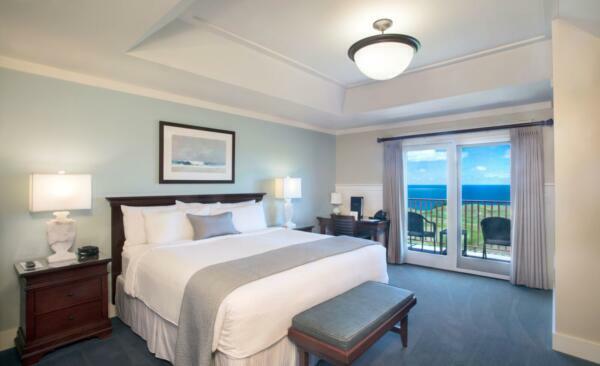 The suite and ten of the rooms face west with breathtaking views of Lake Michigan, while the other five offer sunrise views. Each guest room is furnished with a king bed, desk and chair, flat screen television, stand up shower, and a private walk-out porch. The Lodge provides an elegant, comfortable, and private environment for all guests. The Lodge offers a variety of services, such as laundry care, room service, business center service, and more. The Clubhouse offers private locker rooms that include showers for guest's use. Private Balcony overlooking Lake Michigan and the West Side of the Bluffs Course. Add a special package to your room and let the celebration begin!